I've been involved in magic since I was only five years old....that was the year I got a "My Favorite Martian" magic set. Magic has been a passion and way of life for me ever since. I progressed from magic sets to magic tricks purchased via mail order from Flosso-Hornmann, Miami Magic, Abbott's, Tannen's, and many more. I began to perform for "real" audiences (not just family) in the early 1970's...1972, to be exact. I was twelve years old and out making money doing what I loved to do. And for all intents and purposes, things have never changed! I found myself working in the magic business at a young age, starting in fifth grade when I found a wholesale source for jokes and novelties. I bought some items and began my sales career, selling mainly to my classmates. This career was a profitable, albeit brief one. It turned out that itching powder and sneezing powder were not a good fit with the educational system! Eventually, I "graduated" to working in "real" magic businesses. 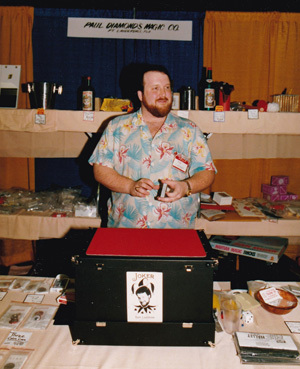 I spent a couple of years running the mail order business for Paul Diamond (after he sold his retail shop) in Florida. 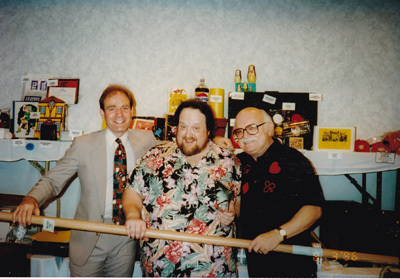 I spent a couple of years running my own retail business (along with partners Lee Freed and Jim Duncan). I also spent a couple of years managing "Land of Magic" in Florida. Of course, I was also traveling to conventions regularly for these dealers. Many of you who buy from me today first met me at a convention where I was working for another dealer. I've been very fortunate to have attended conventions all over the world and have met many of today's stars in magic (not to mention quite a few who are no longer with us). In 1994, I moved back to New Orleans from Florida and began something new...sales via the internet, a brand new thing at the time. A lot of people now take credit for being the first magic dealer to offer sales on-line. I don't claim to have been the first...I don't know who was. But I was certainly one of the "early" guys. I offered an occasional list of new, used and collectable magic. I built my mailing list up substantially and was eventually sending out ten to twelve lists a year. Some of these lists were HUGE, with as many as two hundred items on some of the larger ones. Other work obligations caused me to curtail my lists several years ago. I'm sorry I didn't continue, because I had nearly reached an important milestone list...in November of 2013, I sent out my 194th list. I'm sorry I didn't reach List #200...that surely would have been some sort of record (it would have been a record for me, at least!). I've continued to accumulate new and used magic, with some nice collectable items, too. Rather than go back to issuing lists, I decided to go with a website. My only real complaint from customers when I was issuing the lists was that I would list a one-of-a-kind piece and it would sell instantly. Someone responding to the list a day or so after it was sent out usually lost out on many limited availability goodies. So... the website fixes that problem. When you look at the description on the site, you'll be able to see whether the item is still available or not, without having to send me an e-mail to ask. If you see an item listed that you want and it shows that it's available....it really IS available! Just put it into your virtual shopping cart, pay for it, and it'll be shipped to you immediately. I want to thank so many of my faithful customers over the years. People I met at conventions...at magic shops...at my lectures. And then so many good customers whom I've yet to have the pleasure of meeting in person! Many of these folks were there with me when I e-mailed my first lists in 1994, and they got the most recent one in 2013. I consider all of them not just customers, but friends. If you've never purchased anything from me, I hope you will...and I hope you'll become a friend, too.